This scenery is made in memoriam of DKM. Scenery developed by Freddy De Pues, NAPS. Thank you Kirk @ Sarasota Avionics and Carole @ Agape Flights for allowing me access to the main apron. Beware …. this package is tweaked for better performance, but large texture files and hundreds of objects. 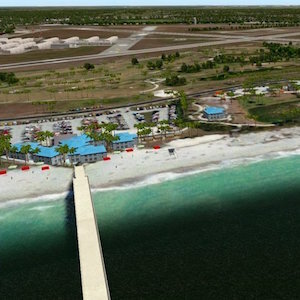 Venice is a GA airport in Sarasota County. There are a bunch of NAPS airports & a city scenery (Sarasota-Bradenton-LakeWood Ranch) in the area, which is where I live. Venice Municipal Airport (VNC) was built in the early 1940s by the United States government to serve as a flight training facility during World War II. At the end of the war, the airport was given to the City of Venice with the stipulation that if it were not used as an airport it would revert back to the U.S. government. Today it is a general aviation facility located 1.7 miles south of the downtown area, along the Gulf of Mexico shoreline, on approximately 835 acres. It has two 5,000-foot runways which intersect each other. They are both 150 feet wide, have medium intensity runway lighting (MIRL), runway end identifier lights (REILS) and precision approach path indicators (PAPI). Although the city leases some hangar and tie-down space on an annual basis, the Fixed Base Operators (FBOs) coordinate parking for visiting aircraft. The airport is operated solely from the airport enterprise fund and receives no money from the city’s general fund. Money for the enterprise fund comes from the airport’s land leases. There are about 212 aircraft based at VNC, as estimated in 2004. – High precision pavement markings, taxiway feathered edges.